1 of 3 In a large bowl, combine bread crumbs and milk. Add turkey, egg, cilantro, jalapenos, Southwest seasoning and salt. Gently mix until combined. Form into 12 patties, using a scant 1/4 cup for each (about 3 inches in diameter). Place on a wax-paper-lined baking sheet and refrigerate 30 minutes. 2 of 3 Heat a gas grill or stovetop grill to mediumhigh. Lightly grease grill rack or stovetop grill. Grill sliders for 3 minutes. Turn and place pepper Jack on top; grill 3 additional minutes. Remove to a plate. 3 of 3 To serve, spread 1/2 tsp mayonnaise on bottom half of each roll. 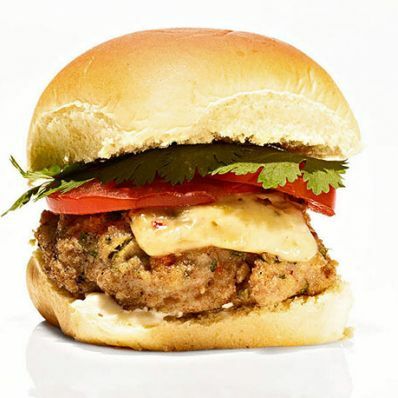 Layer with a turkey patty, a few tomato slices, cilantro sprigs and a squeeze of lime.